Back in 2008, Texas’s Irving Independent School District made an unprecedented move by green-lighting Lady Bird Johnson Middle School. If the project was successful, the 152,000-square-foot school would break new ground in the world of green building, becoming the first net-zero middle school in the state of Texas, as well as the first and largest net-zero middle school in the United States. It made it. Lady Bird opened its doors in fall 2011 and earned every distinction. A lot has changed in three years. What originally made Lady Bird so unique is becoming more commonplace, especially in the South. In 2012, for example, Kentucky’s Warren County Richardsville Elementary School became the first net-zero public elementary school in the country. As net-zero schools proliferate, revisiting those early adopters can provide valuable insight for project teams just now reaching for net zero. Beneath this football field is a geothermal system that naturally conditions the building. Lady Bird is the first school in its district to use a geothermal system. Lady Bird Johnson Middle School is holding up well. Don Penn is a geothermal engineer with Image Engineering Group, which handled Lady Bird’s mechanical, electrical, and plumbing (MEP) engineering. When planning for the school began in 2008, Penn says the biggest challenge was being in uncharted territory. Never before had his company combined so many different renewable-energy and sustainable-building systems—including geothermal water-source heat pumps, greywater-reuse systems, 2,988 solar photovoltaic panels, and an academic curriculum based on all of it. With the help of Bosch, a global appliance manufacturer that has grown to provide a variety of sustainable solutions in recent years, the team also incorporated wind turbines, LED lighting, and high-efficiency glazing. Photovoltaic panels cover Lady Bird’s white roof and provide 100% of the school’s energy over the course of a year. The Solyndra panels feature cylindrical tubes that capture sunlight from 360 degrees. 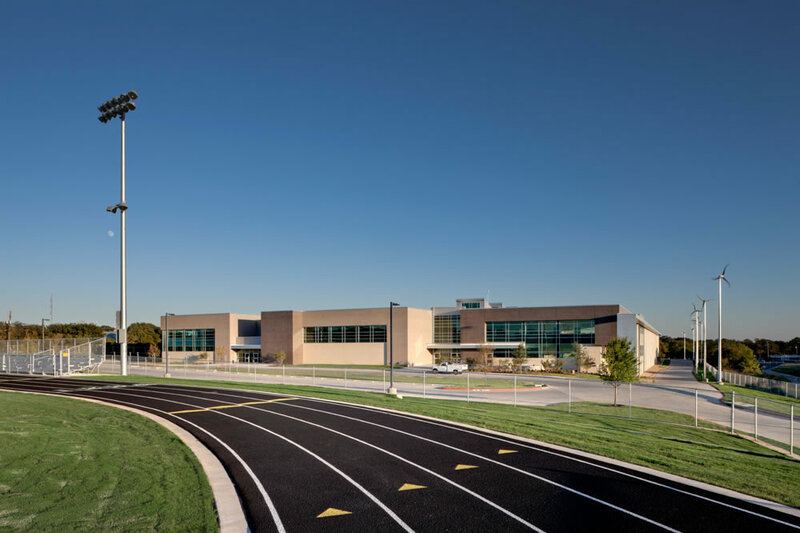 Corgan Associates, the architecture firm that designed the middle school, had an entirely different set of challenges to navigate in order to ensure the school continued operating at net zero after completion. Susan Smith, a vice president at Corgan Associates, says the site was the biggest hurdle. Much of the surrounding land was developed, leaving them with one long, skinny plot to work with, oriented north-south. They conducted lighting and shading studies in order to optimize the available sunlight. Designing the school was difficult enough, but making sure it would be used efficiently was tougher yet. Teachers and other school officials had to commit to sustainability. “The building user must use the building efficiently in order to capture the operational cost efficiencies of the sustainable systems,” Smith says. This is especially true when considering that the school itself is part of the curriculum. All of the data collected on energy savings and expenditures is used as part of math and science classes, and older students learn about sustainability by way of the green design elements and technology featured on campus. Lady Bird principal Carrie Daniels says the school was a way to put the city, Irving, on the map. But something even more meaningful has emerged in the three years since the school was completed: the understanding that the school elicits tremendous pride in its young students. A kiosk educates students about wind energy. All of the data collected on energy savings and expenditures is used as part of math and science classes. Daniels’s own child, who also attends Lady Bird, brought home that mentality—literally. At home, the two have talked excitedly about the school’s many “cool” features.